When we write a blog or a web page, we want more and more people should read it but for that, your page should come on the Google first page. People generally, don’t want to visit the second and third page to find the content, even you and I don’t do it. We generally got the relevant, informational and good content on the Google first page. Google uses many algorithms to search a best and relevant content for us. If we closely observe and understand these google algorithms we can also find our blog or content on the Google first page and this well we great. 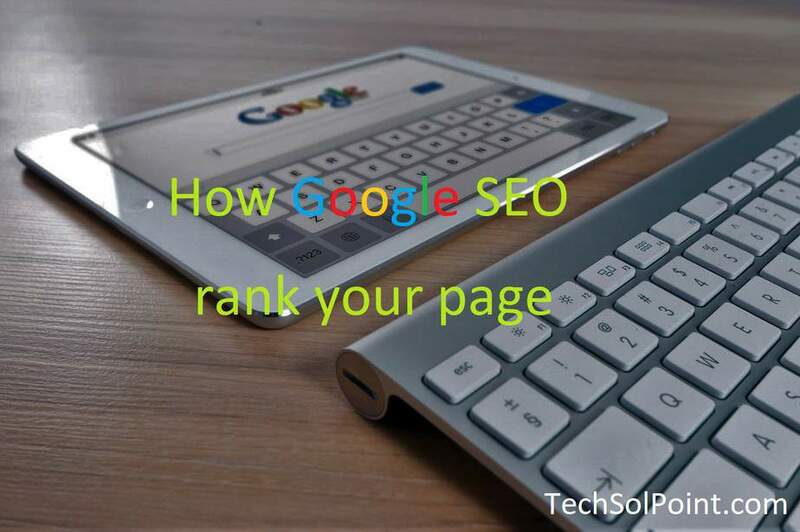 So let’s find out how these google algorithms work and How Google SEO Rank Your Page. This algorithm detects duplicate content. If your content is copied from some other existing website, webpage or blog then your page will be blacklisted. It also checks the quality of the content. Keyword plays an important role in Google search. But too much using of the keyword is not beneficial. This algorithm detects Keyword stuffing also. To overcome from this you can verify your content on “www.duplichecker.com”. This algorithm detects links. Many people add irrelevant and unnecessary links but if you do so your site will be ranked low by Google. Links act as a voter to the site. The more and trusted links your site have, the higher the page rank your site has. To improve their ranking people link their site with some popular site which is not relevant to their content. Penguin just identifies those backlinks to lower the ranking of the page. To recover from it you first check the link by using “SEO SPYGLASS”. Link only trustworthy sites which help to increase page rank. This algorithm changes the searching way of Google search engine. This algorithm is designed to focus on the meaning behind the words or statement or query searched by the user. The results are “precise and fast”. The result that comes is relevant for the user. In this algorithm instead of focusing on words or keywords, it focuses on the complete sentence or query. This algorithm brings a great impact on the local search result and local business saw a typical change in their website analysis data. In this algorithm user location play an important role. Google’s location and its distance ranking parameter were improved to provide better local, relevant search result to the user. Let say we want to search hostel or restaurant in some local area. After Pigeon algorithm, the great result comes as its search based on the distance parameter. You also notice when you try to find hostel or restaurants nearby. Mobile becomes an important platform for search. Nowadays most of the search is done on mobile. If your page is not mobile compatible then SEO lower its page rank. The best way is to use a mobile compatible framework. Your site just not only compatible for mobile but also for other devices like tablets, Android TV, and other media. According to Google it a part of Humming Bird algorithm (as mentioned above). It is machine learning, artificial intelligence system that helps to understand the meaning of the query searched by the user and provide best matching result based on the query. Machine learning is a technology where computer teaches itself, rather than being taught by someone else. Artificial intelligence (AI) where a computer can be smart as a human being in acquiring knowledge. It is considered as a 3rd most important factor in SERP (Search Engine Results Page). This algorithm focuses mainly on local search result depending on searcher location. Add your location it will provide more results based on the location. If you are running any local business then suitable keyword that matches your business and also provides the location in Google maps with complete address. This help to boost your nearby search results. Possum is very helpful for local business. This is one of the major factors in SERP. It targets websites that violate webmaster rules, norms, and guidelines. Most of the sites are a blog. They are created to earn money from ads. These blogs don’t contain relevant content and most of the blog content is hidden by ads. If you show ads on your page then make sure the content is relevant, high quality and provide ample information. So we can see how smartly the search engine works. To increase your SERP you must pass through these filters. Don’t try to cheat Google search engine. Make sure your page contains relevant information. Google keeps on upgrading its search engine to provide best results that are useful for the user. If people find you page useful then it will definitely increase your ranking.